Huge congratulations are in order for Erika McKenzie-Chapter of Pennyroyal Farmstead & Winery. Erika is the first recipient of the Jennifer Bice Artisan Dairy/Cheesemaker Grant Award, a $10,000 scholarship created by Redwood Hill Farm & Creamery’s founder, Jennifer Bice, with the intention to mentor and support the next generation of cheesemakers in California. Today the California Artisan Cheese Guild (CACG) is pleased to announce the recipient of the first Jennifer Bice Artisan Cheesemaker Grant Award. 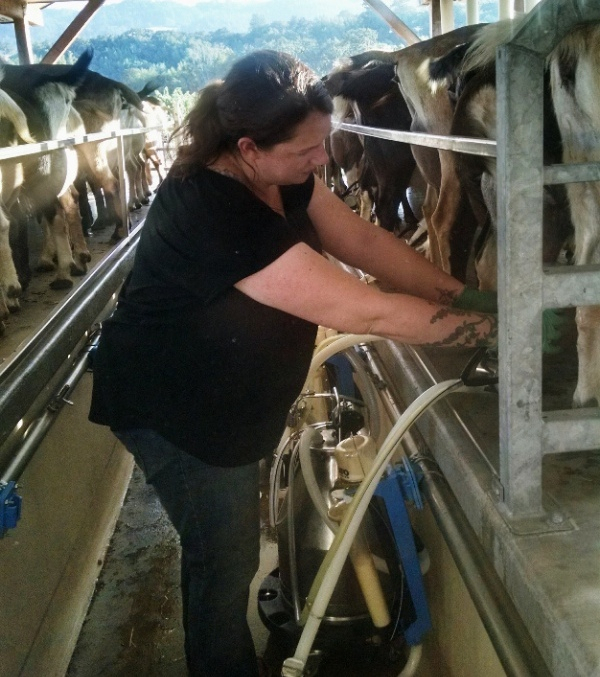 Erika McKenzie-Chapter, co-owner and head cheesemaker of Pennyroyal Farm, located in Boonville, California (Mendocino County) has been chosen from a field of ten CACG member applicants. Applications were reviewed by the California Artisan Cheese Guild’s Selection Committee and will be administered through CACG. Pennyroyal Farm began making farmstead goat cheese in 2012 under the leadership of Ms. McKenzie-Chapter. Pennyroyal Farm is home to more than 100 goats, and 100% of their milk is used to make award-winning fresh and aged goat cheese. As dairy co-owner and head cheesemaker of Pennyroyal Farm, Erika McKenzie-Chapter manages the dairy and creamery. Business partner Sarah Bennett oversees the vineyard, a flock of chickens, and a tasting room that sells their cheese and wine. A graduate of UC Davis with degrees in Animal Science and Animal Biology, McKenzie-Chapter dedicates time to teaching cheesemaking and animal care to hobbyists while contributing timely milk component data to research. “I am thrilled to receive this magnanimous award from Jennifer Bice,” says Ms. McKenzie-Chapter. “We are a young, growing company and these funds will help us purchase equipment, some of which I thought would take years to be able to afford, that will improve productivity and efficiency on the farm, and allow us to increase production of our farmstead cheeses,” she adds. The farm was named for the wild pennyroyal mint that carpets the sixty-acre farmstead and vineyard in Anderson Valley. CACG is the state’s only nonprofit dedicated to sustaining California’s artisan cheesemaking community. With a mission to celebrate the quality and diversity of artisan cheeses through partnerships, outreach and education, CACG provides education and networking opportunities for cheesemakers retailers, enthusiasts, and extended industry professionals.